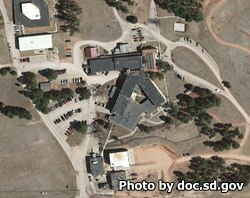 Youth Challenge Center is part of the STAR Academy located in Custer South Dakota. It is a juvenile corrections facility that houses young men between the ages of 14 and 18. The current capacity of this facility is 24 offenders. During the juveniles stay they are provided with clothing, medical and dental treatment, and a variety of individual and group counseling. As an accredited high school offenders at the Youth Challenge Center can earn a GED during their stay. Juveniles at the Youth Challenge Center will participate in programs that were determined to be beneficial to them during the initial assessment phase, these programs include life skills courses, as well as substance abuse and mental health treatment. You can schedule a visit at Youth Challenge Center by contacting the juveniles corrections agent and requesting a visit at least 48 hours in advance.